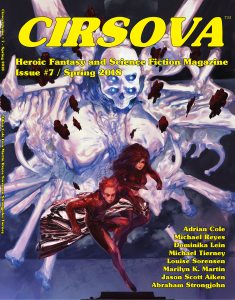 The last three stories in this spring 2018 edition of Cirsova are shorter works that make for a welcome change of pace. The earlier stories in the issue bring the emotional heat or the high-stakes adventure, but there’s more to life than pathos and pulse pounding adrenaline. Putting the two lightest stories back to back strikes me as an odd decision. One of the selling points of Cirsova is the eclectic nature of the stories it contains. Each issue represents a grab-bag of fun fiction that runs the gamut, and that “box of chocolates life” approach serves it well. Sliding one of these light pieces in between a couple of heavier works would help serve as a palate cleanser to help those of us who read the collection straight on through decompress after the heady wine of a Machu Hampacchu or the dark sliminess of The Iynx. If you’re a fan of sci-fi then you are familiar with the trope of a massively powerful galactic civilization meeting humanity for the first time. That central premise lies at the heart of Criteria for Joining the Galactic Community, by Michael Tierney, and in fine traditional form, the President of the United States finds himself Earth’s unexpected ambassador. In a compact story like this, one gag is enough, but Tierney manages to squeeze in a nice one-two punch with a deft touch of humanity for a President in way over his head. He also does it without the sort of cheap shot political theater that would bury the story under a pointless virtue signal. Another point in this story’s favor. Anna and the Thing, by Abraham Strongjohn starts off as a typical sci-fi bounty hunter struggling to bring his beautiful target back alive without getting killed in the process. The set-up is standard, though well executed, and fits in perfect with a couple of the earlier stories in this issue. The resolution hits the reader with a nice little curve ball that in the hands of a lesser writer would feel cheap. Given the skill with which Strongjohn slings words, it works. My Name is John Carter (Part 6), by James Hutchings rounds out the issue with the usual celebration of masculine adventure told in fine traditional mythopoetic form. If the choice were mine, Hutchings would serve as this nation’s poet laureate, and we’d see a lot more epic ballads proclaiming the greatness of the American system and way of life – including poems about clean limbed warriors and hot chicks with long blades and radium guns fighting alien hordes on far flung frontiers – and a lot less of that free verse nonsense you get from celebrated hacks like Angelou.